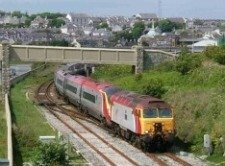 Here is the news from Anglesey for August 2006. So no need to worry, you may find what you are looking for here. At Anglesey Today, we will always keep an archive of past news which readers may find to refer back to interesting in future years. The Dublin to Holyhead Ferry, Jonathan Swift, hit what might have been a whale at 14h00 BST on Tuesday afternoon, about half an hour out from Holyhead. On impact the ferry was travelling at about 40 knots, but none of the passengers was injured, according to a company spokesperson. Around 4,000 passengers booked for the crossing will be transfered on to the cruise ferry. As for the Jonathan Swift, she will spend up to 2 days in dry dock to see if there is any damage. This timescale may be longer if repair is needed. Property sales on Anglesey seem to be stuttering. 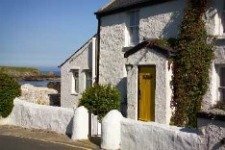 Only a few days ago a number of supposedly highly sought-after apartments in Trearddur Bay failed to find any buyers during an auction. And a nearby development of quality properties is finding it difficult to get people to part with their money. All this against a backdrop of the Bank of England raising interest rates a quarter of a point to 4.75 per cent to dampen down inflation. This is the first rate increase in two years. June inflation was up to 2.5 per cent, which is above the 2 per cent target set by the government. The main culprit appears to be the recent huge increases in energy prices, notably oil and gas. Meanwhile, Halifax Bank said that house prices fell 1 per cent for the three months ending in July. Saga Ruby cruise ship anchored off Holyhead on Saturday morning (5 August), and was greeted by a shroud of sea mist and fine rain. The passengers were not to be denied because by late morning the sun broke through and temperatures climbed towards 20 degrees C.
The Saga Ruby left sunny Holyhead this evening sailing south westward for Cobh near Cork in Ireland. 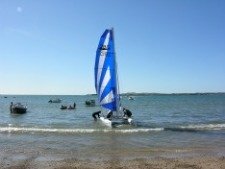 This afternoon Anglesey temperatures reached 21 degrees C and with light (5 knot) south westerly winds and good visibility, our visitors will have had excellent conditions for exploring the island. We now wait for the Golden Princess, due next weekend. 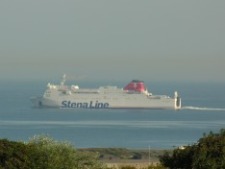 To see a photo of the Saga Ruby off Holyhead Breakwater see link below. How will Anglesey Mining plc on Anglesey be affected by the latest Copper story emerging from Chile? News that miners from Escondida Copper mine, the largest privately owned copper mine in the world, have gone on strike over a new pay deal could have a big impact on world copper prices. Though at this stage Anglesey Mining plc is only carrying out a feasability study on a potential 6 Mt reserve of copper and other metals, the Chile incident could impact on future innvestment decisions here on Anglesey. The incident at the mine, owned by BHP Billiton (57.5 per cent) and Rio Tinto (30 per cent) could act as a catalyst for further dispute elsewhere. With record profits recorded by the major miners like BHP Billiton and Rio Tinto, against a background of historic high copper prices, it is inevitable that other stakeholders will look for a fair slice of the action. But how confident is Anglesey Mining of finding ore of sufficiently high grade and in sufficient quantity to make development viable at the Amlwch site on Anglesey. Harbour Porpoises were sighted off South Stack, Anglesey today. As early as 6.45 a.m today, a harbour porpoise was seen breaking the surface about 200 metres offshore. 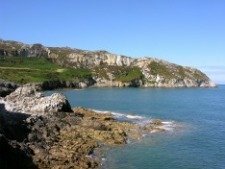 This is a good area to spot harbour porpoises and bottlenose dolphins, both of which move further north along the West Wales coast during this time of the year. With the puffins, razorbills and guillemots now gone, the gannets seem to be in the ascendancy. Along with the cetaceans they feast on the plentiful supply of mackerel off Anglesey. Indeed, here at Ellin's Tower, South Stack the RSPB warden tells me how the porpoises and dolphins will follow the mackerel in towards the warmer waters off the rocky coastline. And here also are fishermen and gannets. Seems the mackerel holds up the food chain around here. It's interesting too that puffins, terns and guillemots don't go for mackerel as they are too big. Instead, they feed on sand eels. As I walked up the South Stack cliff steps from the lighthouse, the smell of dead fish was unmistakeable. Scatterings of sea pinks, heather and yellow gorse lay on the parched green tops along the path. Above me was the eery sound of the telephone lines whistling in the catabatic winds on the cliff face. Below, like moving decorative figures on top of a walnut cake, were brave climbers attempting a difficult challenge on the South Stack cliff face. Then a gull squeals on a nearby rocky ledge announcing its imminent take off. Seconds later, a brief silence breaks the cacophony as the gull glides along on a rising thermal viewing the climbers and sea life below. Remember, if you sight any stranded cetaceans along the coast, call the RSPCA on (08705) 555999. Wylfa Latest News keeps you up to date with what is happening at the Nuclear Power Station on Anglesey. Launching tomorrow is the Wylfa Future Uses Questionnaire. This is your chance as stakeholders to have your say on what you want the site to be used for in future. Poll results will be used to make a report forming part of the Nuclear Decommissioning Authority consultation on End Uses of Nuclear Sites. Anglesey and Gozo may be about to form closer ties. The Permanent Secretary of the Maltese island, Mr Joseph M Micallef, will be the guest of Albert Owen MP from Thursday, 17 August 2006. Mr Micallef is understood to be visiting distinguished members of the Anglesey maritime community during his two day visit. There are hopes of strengthening the ties between the two islands. During his stay Mr Micallef may visit Holyhead Maritime Museum, Menai Bridge and Moelfre. Here are two communities where the sea has played a notable part in their respective histories. Gozo, an island situated about 5km North West of Malta, is the second largest island in the Maltese Archipelago. With Malta and Comino, Gozo makes up The Republic of Malta, now a member of the European Union. Holyhead welcomes The Golden Princess cruise ship on 1 September for the second time this summer. The Golden Princess should have anchored in Holyhead Bay last Saturday but the northerly winds would have made the conditions too difficult for the launch boats. And again on 7 September Holyhead will welcome the Clipper Adventure cruise ship. Let us hope sea conditions are better on this occassion. Anglesey and Gwynedd County Councils have agreed to work together to secure the economic stability of the North West Wales area. Following the announcement that Wylfa Power Station will close in 2010, the local economy of Anglesey and North Gwynedd will need an economic boost to absorb the impact of the the decommissioning of Wylfa after 2010. Anglesey County Council Leader Cllr Gareth Winston Roberts said that "a real financial commitment from the Assembly Government ... to secure a viable economic future for [Anglesey] and the Menai area" was now an urgent priority. The real challenge will be to make sure the benefits of new initiatives in the Menai Straits area spread out to the more rural areas of the region. The Welsh Assembly Government has agreed to support the plan. The future of the Wylfa Power Station site needs to be decided by the Nuclear Decommissioning Authority (NDA). Part of this process involves getting the views of stakeholders about what they would like to see happen to the site once decommissioniong begins. Perhaps a new nuclear power station could be sited there or the land could be used for housing or for a country park. Have your say here and vote on the future of Wylfa. The deadline for responses is 20 September 2006. Anglesey residents will soon have their chance to say how they would like to see new European funds invested on the island. The Welsh Assembly Government wants our views on how to invest funds from the new 1.3 billion pounds Convergence programme. These funds will cover regeneration of the Valleys and West Wales from 2007 to 2013 and replace the 2000-2006 Objective One programme. Wales First Minister Rhodri Morgan AM predicted a "golden scenario"for our rural communities when he launched the 10-week consultation recently. He said: "The key feature of the new programme is the higher priority on innovation and getting into the knowledge-driven economy." And Anglesey Council Leader, Cllr. Gareth Winston Roberts said: "With the extra funding we can build on Objective One and make further substantial investments, boosting the economy of Anglesey." The deadline for the public consultation is 6 October 2006. British Nuclear Group (BNG), which operates Wylfa Power Station on Anglesey, is apparently the target of a 400 million pound bid by US engineering giant, Fluor. The offer is believed to be for the whole group, itself a wholly owned subsidiary of BNFL, and not for piecemeal acquisitions. This follows a recent decision by BNFL to break up BNG onto its component parts, which Fluor believes would make it more difficult for the company to compete in the global decommissioning and new build market. With Anglesey now a strong focus for both nuclear decommissioning and new build, the island certainly has an interest in these developments. If you are still looking for something and can't find it, you can try the search facility below.